Just as I was sitting at my desk, preparing to write this column, a sudden squall started outside. A westerly wind picked up to, I'm guessing, 40 mph, and the rain came down in sheets. Luckily our vegetation is made to handle this, sometimes having to survive hurricane-force winds during the summer months. After 10 minutes or so, the wind died down again and the rain stopped. At the bridge table, you might walk into an unexpected storm: a bad trump break. In this deal, how should South play in six hearts when East shows up with all five outstanding trumps? West leads the diamond queen. Declarer wins with dummy's ace and plays a heart to his jack, West discarding a diamond. Since South has a club loser, he has to draw trumps without loss. But that requires taking two more finesses through East. How can declarer get to the board two more times? At trick three, South must lead a low spade to dummy's 10. When the finesse wins (the sun is finally out), he takes a second heart finesse. 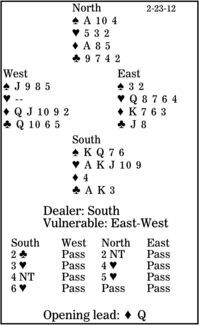 South returns to dummy with a spade, finesses for a third time in trumps, cashes his top hearts, and claims 12 tricks: four spades, five hearts, one diamond and two clubs.